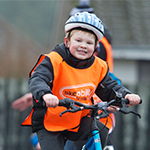 Cycling Scotland co-ordinates Bikeability Scotland, the national cycling programme for children. With a network of trainers to teach bike skills and on-road cycle training, more than 36,000 pupils participated in the programme last year. To acknowledge the enthusiasm and dedication of everyone involved, Cycling Scotland recognises a Volunteer of the Year and a Pupil’s Choice winner each year. 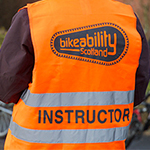 Bikeability Scotland is designed to give children the skills and confidence they need both to cycle safely on the roads, and to encourage them to carry on cycling into adulthood. Volunteer award winner, Gabriella Farquhar, described as “a beacon of positivity and a passionate advocate of safe cycling” has organised and run Bikeability Scotland sessions at Bridge of Allan Primary School for the past four years. In that time, she has gained the support of other parents, who have gone on to become volunteer instructors themselves, and more than 250 pupils have come through the programme. Jacqueline Morrison won Pupil’s Choice based on testimony from P7 pupils who had completed training with her. She is recognised as a champion for cycling at Culross Primary, engaging the whole school community. Her input has had a lasting impact on pupils at the school.